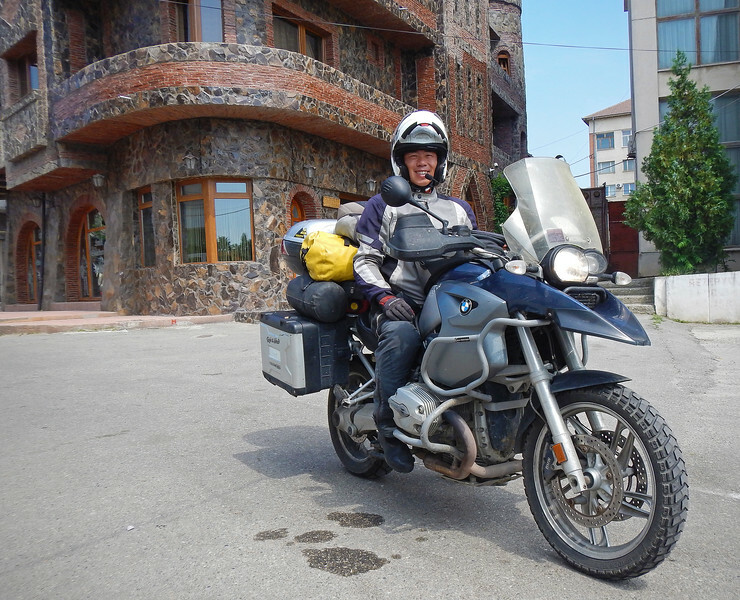 The weather is hot and sunny, and we're leaving Bulgaria and entering a new country today: Romania! Most of the cross-border traffic takes the main highway to Bucharest, crossing the international bridge at Ruse. 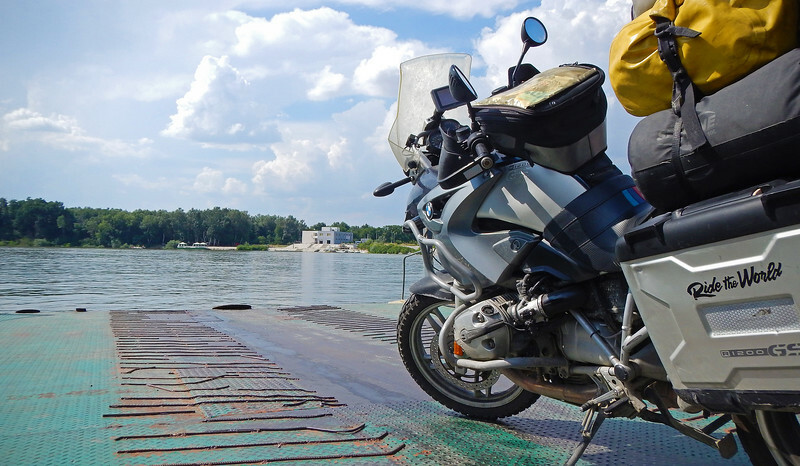 But since we're on a bit of a backroads tour of Eastern Europe, we enter by way of a small ferry SW of Romania's capital city. It's only a short 15-minute trip to get to the other side. 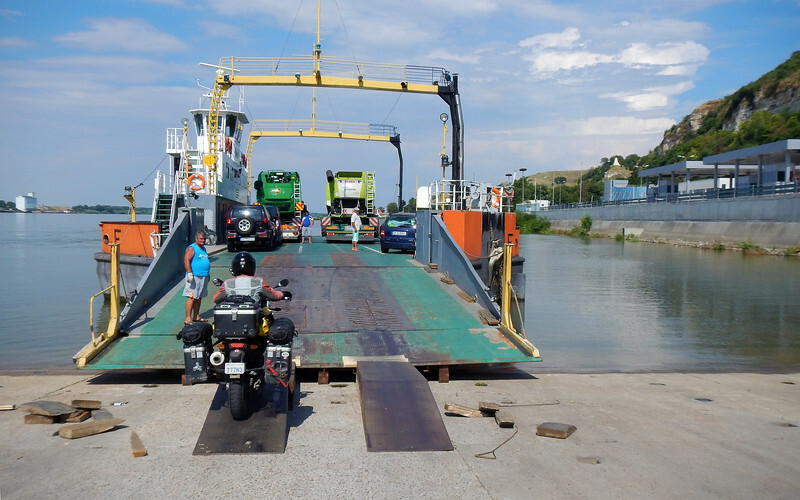 Bulgaria and Romania are not officially part of the Schengen Zone yet, so we have to stamp out and back in again at the ferry docks on both sides. I steel myself for more unfunny Brexit jokes and ribbing from the border guards, but the guys here don't seem to be very friendly. 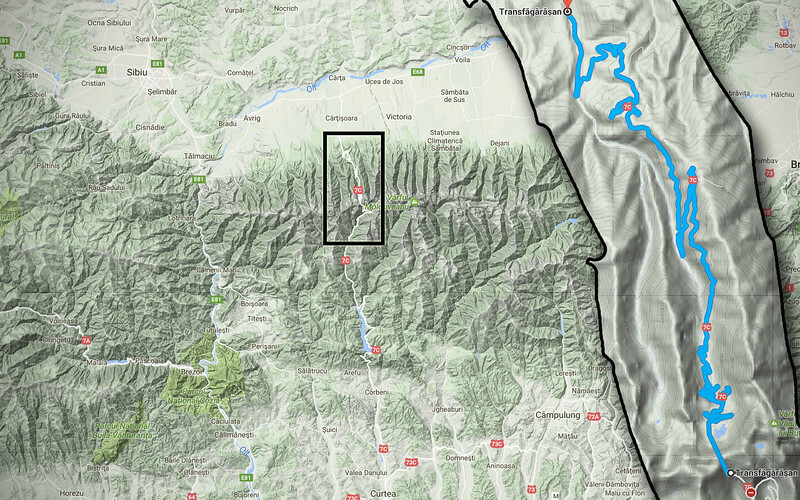 The Romanians keep their nuclear arsenal just outside of Nikopol. Unlike the Bulgarians, they don't bother to Disney-fy their missiles. 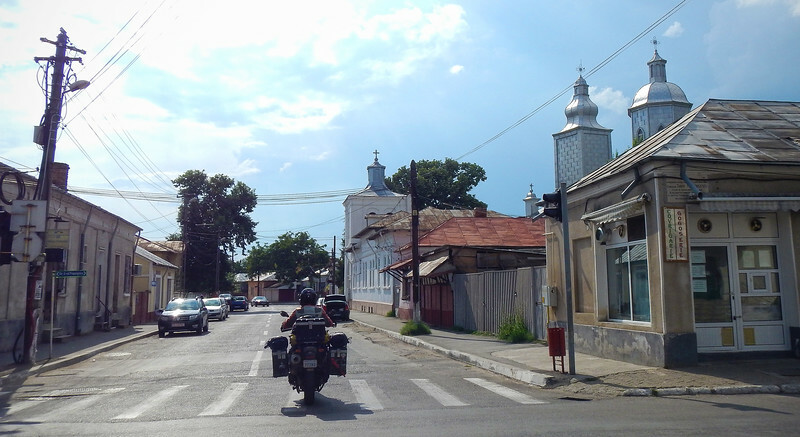 Turnu Măgurele is not a pretty town, except for its churches. But we've done enough traveling to learn never to judge a country by its border towns. 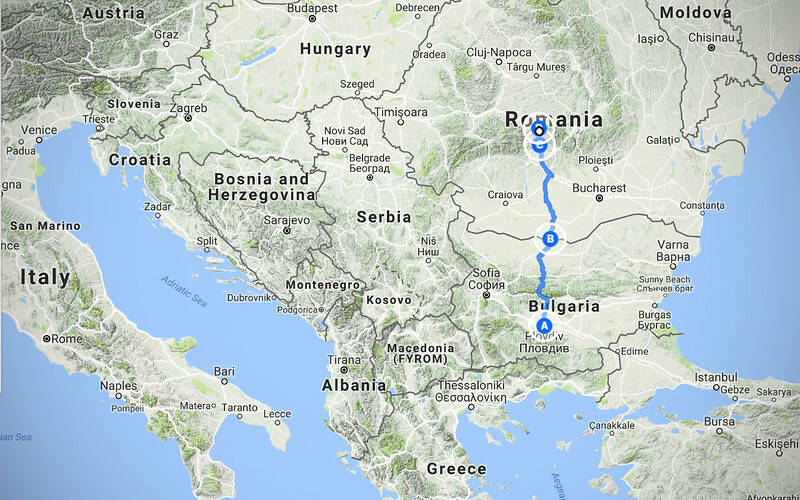 My best friend, who I've known for like half a century, is Romanian so I'm really looking forward to exploring his home country. 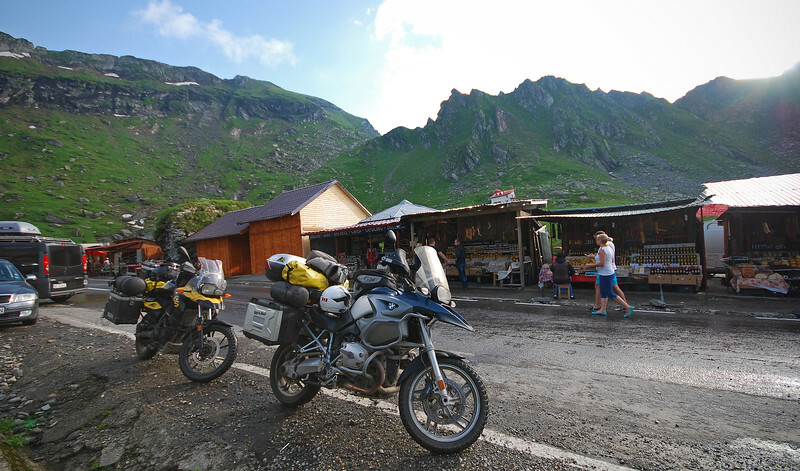 Just like in Bulgaria, the accommodations and food are cheap in Romania. Their currency is the Lei (sounds so close to the Bulgarian Lev), and we found out they don't take Euros in this country. So we got Lei-d at the ATM and then walk around town to try to find a grocery store. 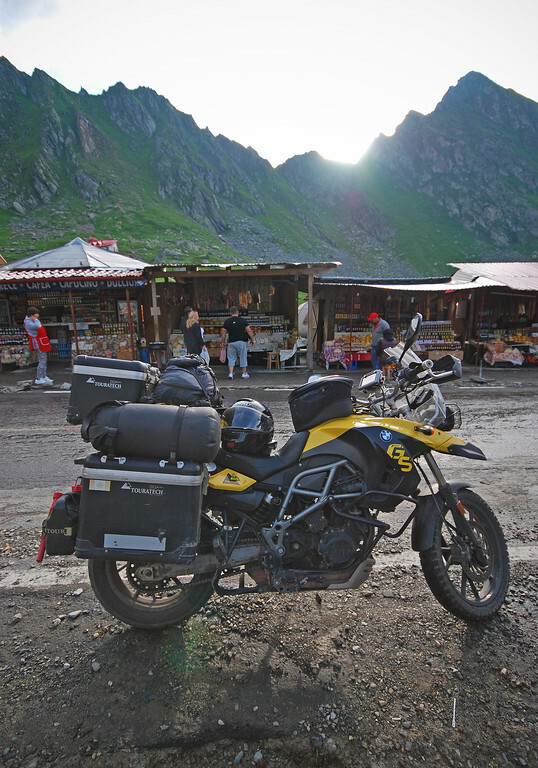 The grocery store in Caracal remains elusive to us, but we do run across a convenience store. Inside, there is a long lineup at the cash register. I notice that most of the people are paying for their goods with food stamps instead of Lev. I feel a bit guilty walking back to our luxury apartment. It's the nicest place we've stayed in since we've arrived in Europe. And we only paid €20/night through the booking service online. That church in the top left looks like a Stave church that we saw in Norway! It's actually a type of wooden church typically found in northern Romania, in the Maramureș region. most of the churches in the south look like the one to the right. Just in case you forgot that there is also another motorcycle & rider at RideDOT.com! Castle Dracula! 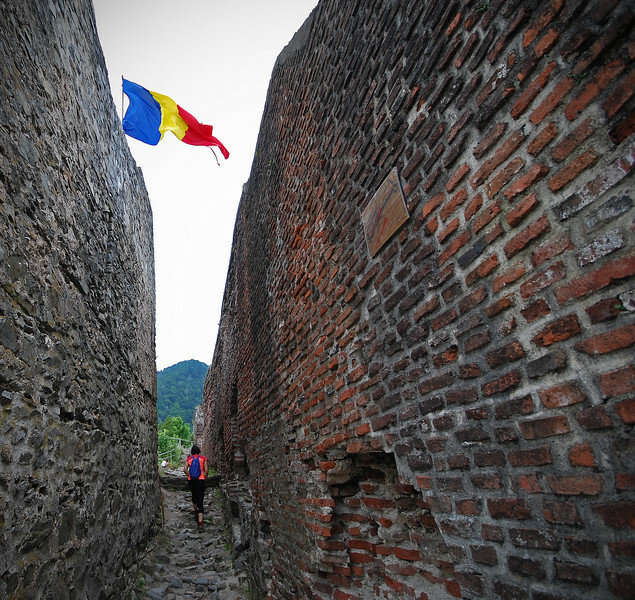 Well, not the literary Dracula, it's Vlad III's castle, Poenari. Bram Stoker's character, Dracula, was based on Vlad Tepes, otherwise known as Vlad the Impaler. Vlad was a nasty, nasty Romanian ruler who was quite fond of impaling people, boiling them alive and cutting them up into little pieces. He was the second son of Vlad Dracul, the surname of which Bram Stoker would base his blood-sucking vampire on. It's a hot day and there are 1480 steps to climb to get up to the Castle Poenari. When we get to the top, we're greeted by impaled people... Nice. 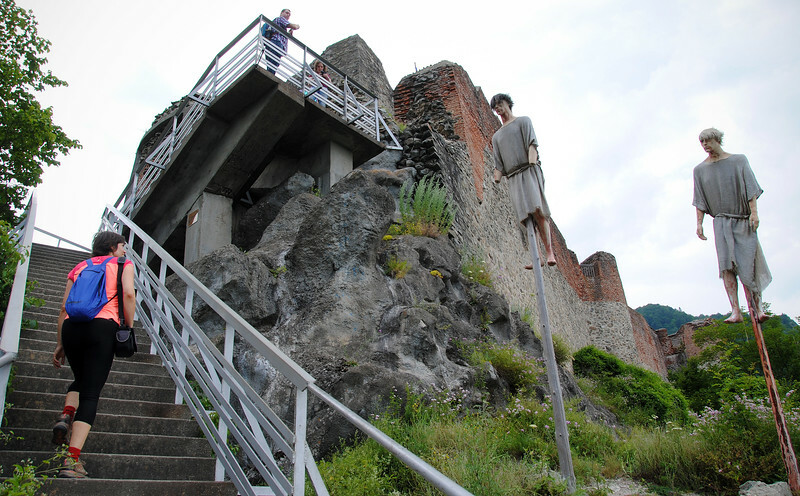 Castle Poenari wasn't actually built by Vlad the Impaler. 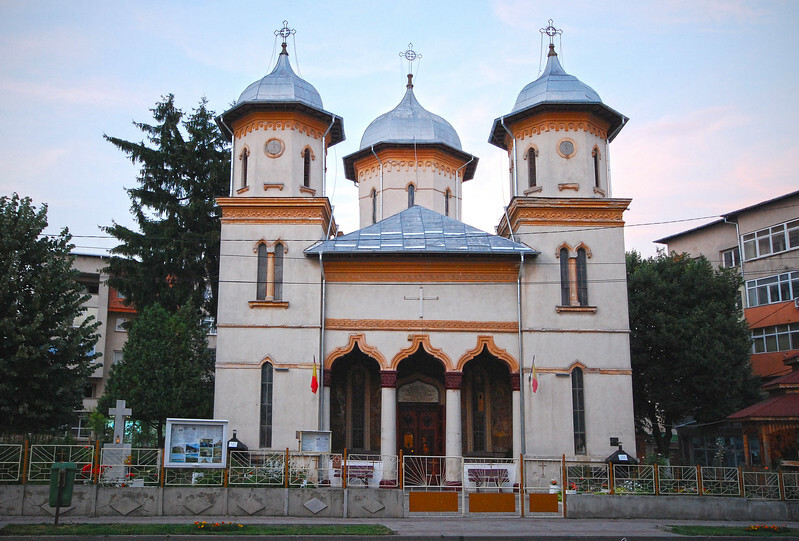 He took it over in the 14th century, 100 years after it was built by the Wallachians, medieval Romanian people. We had to wait our turn to pet the resident puppy. 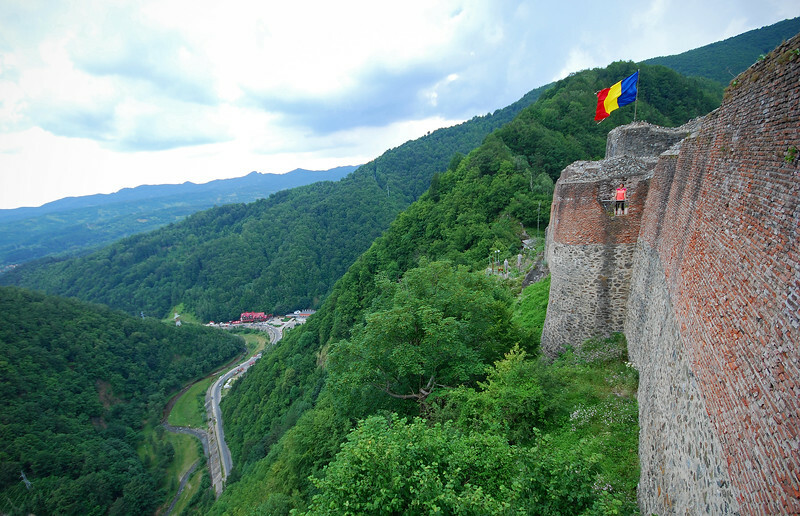 There are actually two Castle Draculas in Romania. The more famous one is in Transylvania and it's called Castle Bran. There's a bit of a feud going on between these two castles. Poenari likes to advertise itself as the "REAL" Castle Dracula, since Vlad Dracul was actually a real person. However, the castle in Bram Stoker's book was really based on Castle Bran despite the character being named after Vlad. Finally! 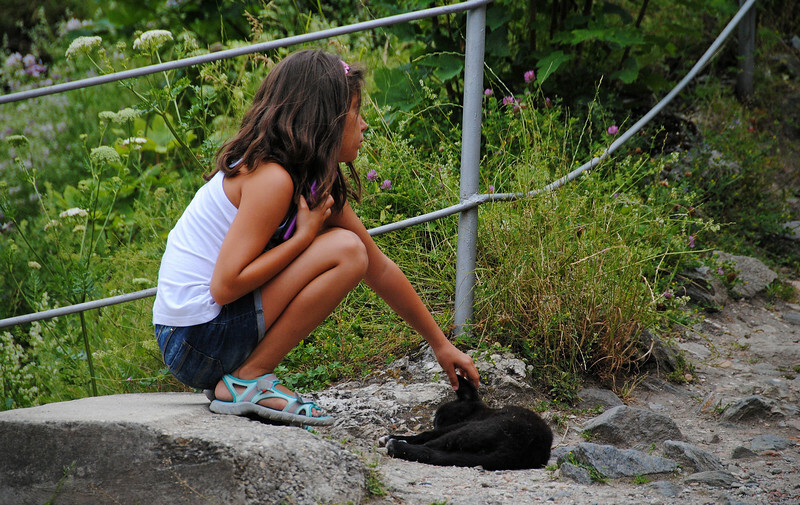 It's our turn to pet the Poenari Puppy! I think this puppy lives up here. There's a water bowl just outside the the ticket office. I'm going to call him Vlad. Because he's a bloodhound. And his favorite food is shishkebabs. 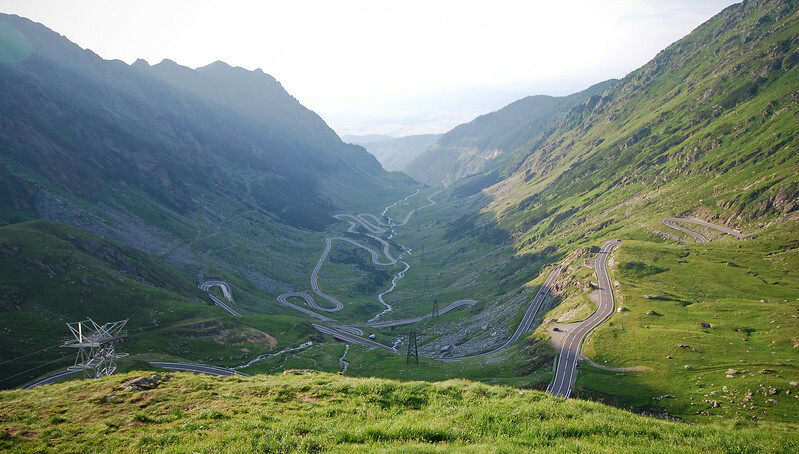 We are now going to ride the road made famous by Top Gear, the Transfăgărășan Pass! 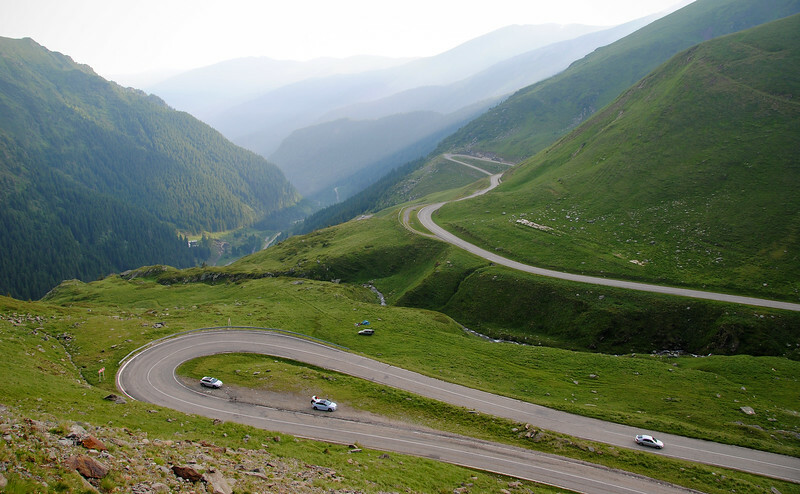 Everybody raves about it as being the most scenic mountain pass in the world, even better than the Stelvio Pass in Italy. Check out the map above! 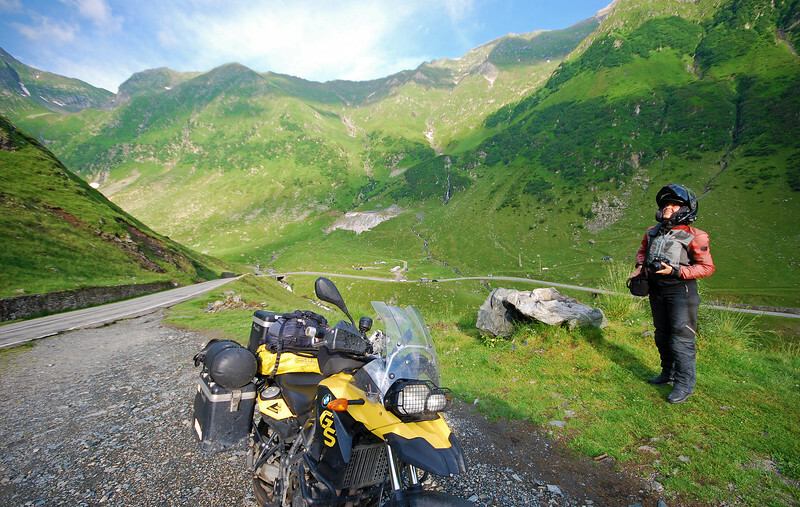 We've really been looking forward to riding this road ever since we heard about it. I pulled out my Sena camera so we could capture the run on video. But then over the Bluetooth intercom, the camera admonished me, "Low Battery Warning". I forgot to charge it! Dammit! 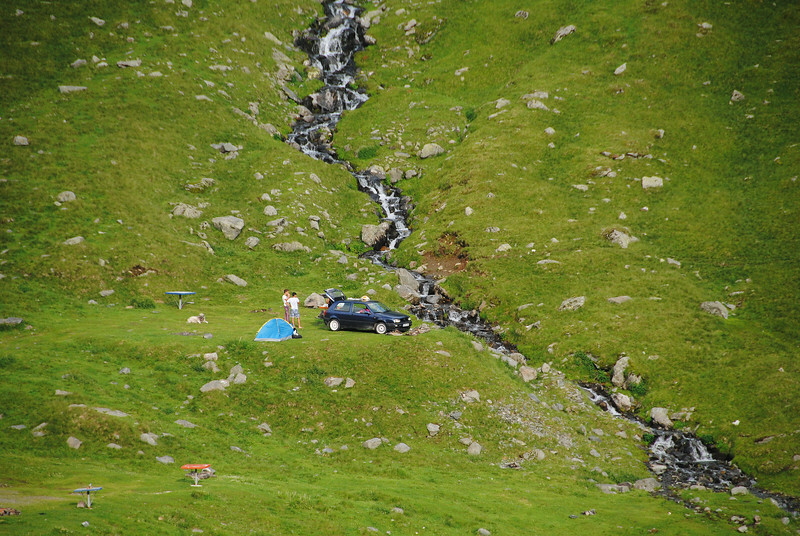 The Transfăgărășan is a touristy road. 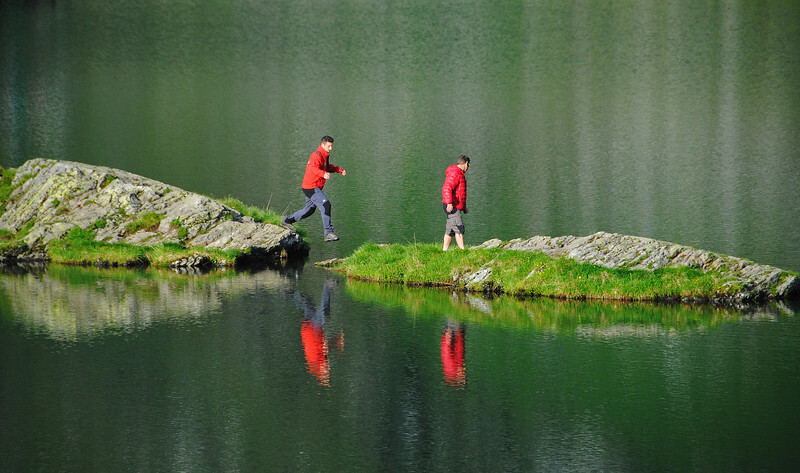 There are a ton of hikers, buses, cars and bicyclists all over the place. 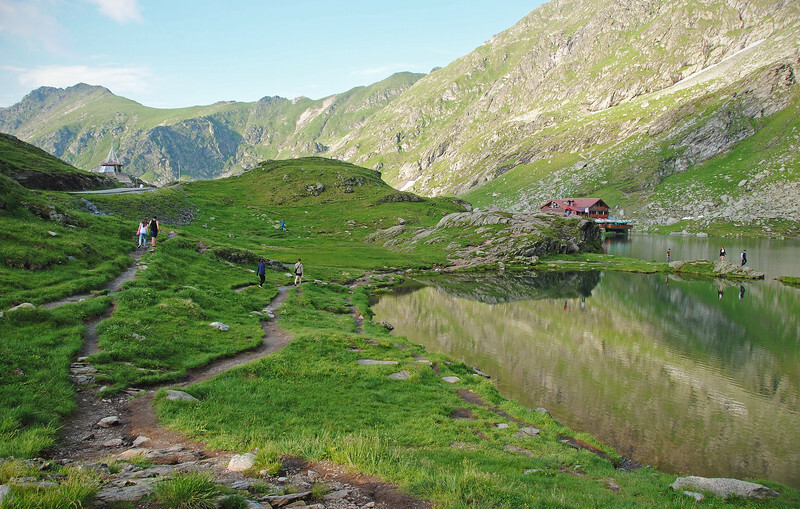 The scenery is wondrous - such vast open spaces to appreciate the Făgărășan mountain range around us. We find ourselves a spot to pull over to take in the beauty. "Ooooh... gotta stop and get a picture from this angle!" I don't care. It's so pretty here. It's a photographer's feast! Behind the village, there's a hiking trail. That reflection on the lake is gorgeous! 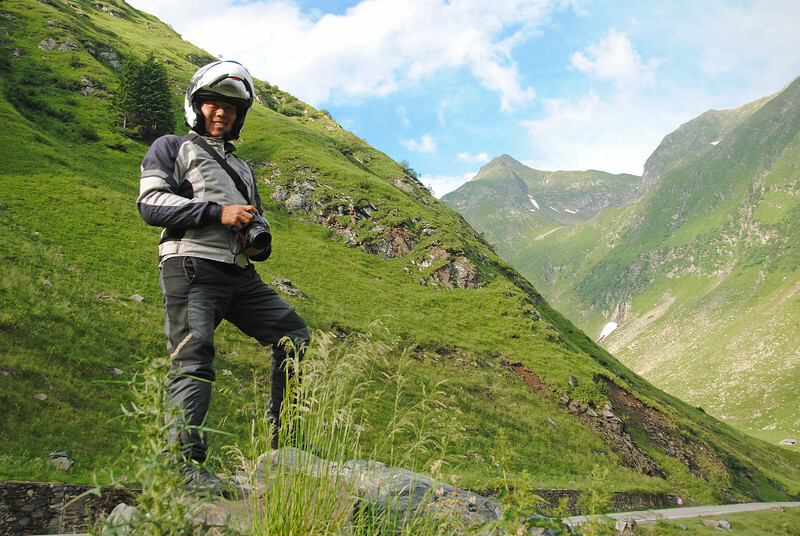 So, was the Transfăgărășan a good riding road? It's okay. Like the Stelvio Pass, the switchbacks are sooooo wide. 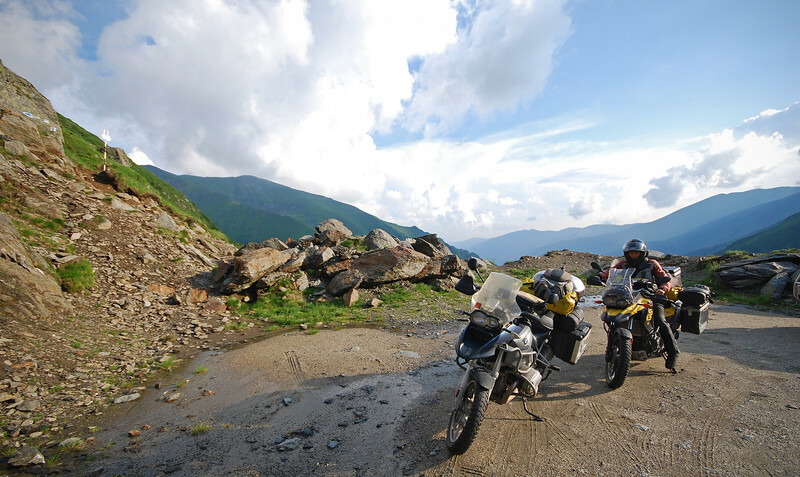 They were built to accommodate tourbuses, so it's really not a very challenging road for motorcyclists. 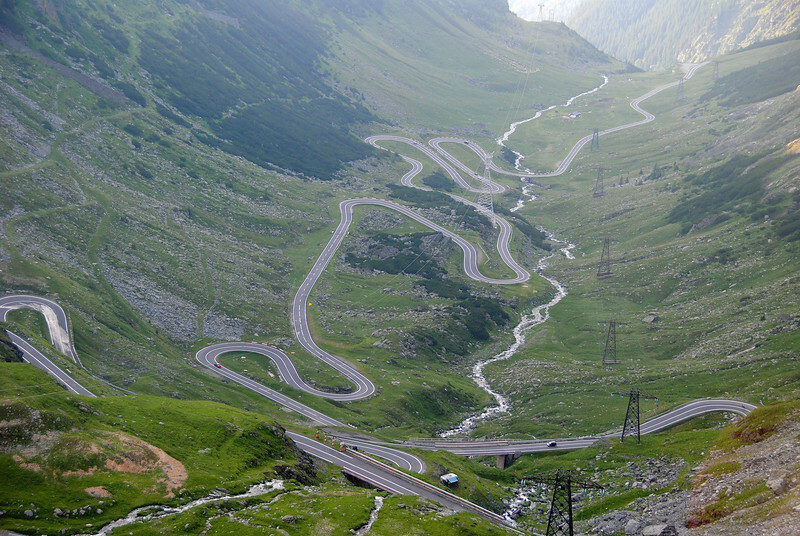 There are much better and tighter switchbacks all over Europe. 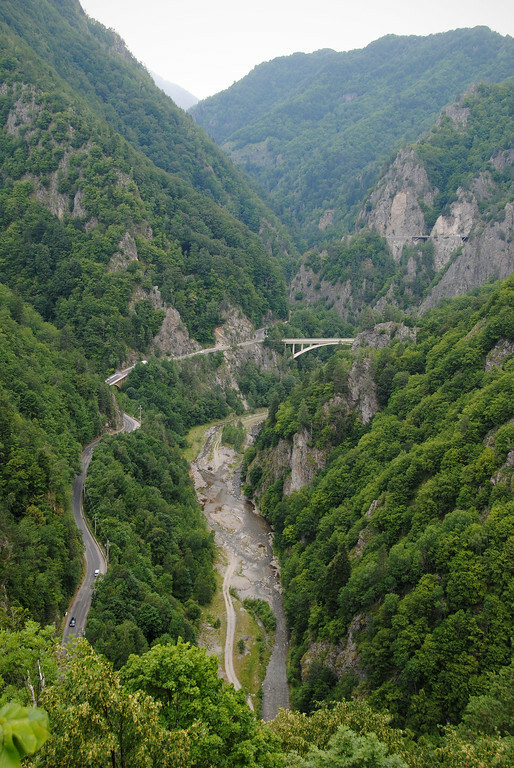 What makes the Transfăgărășan such a magnificent road is the scenery. 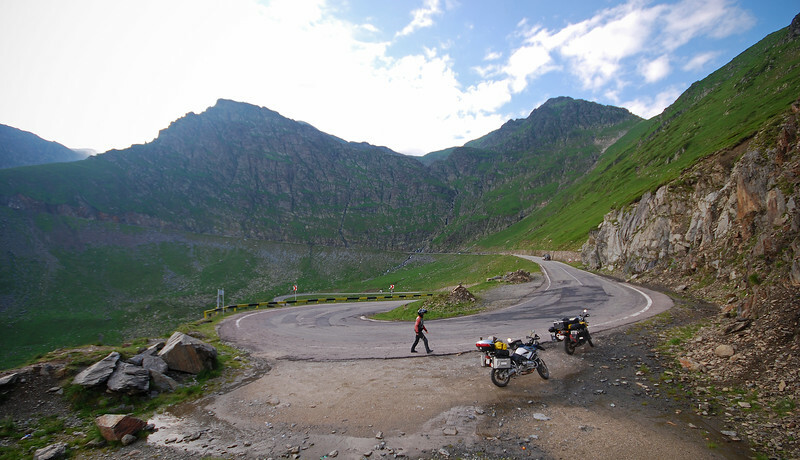 The mountains are really quite beautiful and the road twists so often that you get a different view at every turn. I can see why the Top Gear guys and all the car magazines like to film here. It makes for terrific cinematography! Very nice. Neda and I were babbling to each other at every stop, "It's so beautiful here!!!" Definitely, the highlight of our Eastern European leg. Neda checking out the view from the top. It's chilly up here! 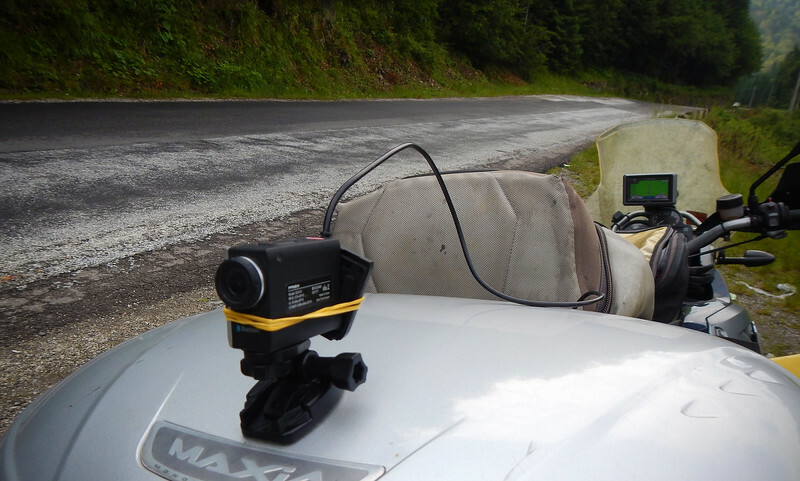 On our way down the pass, Neda radios me, "Is your foot resting on the rear brake? Your brake light is on." "Nope". I tapped the rear brake a few times. "Is it still on?" "Yeah, your brake light is solid." Crap. The pedal must have gotten stuck or something. We pull over and I inspect the rear brake. Nothing mechanically wrong with the pedal and the rear pads aren't binding. I can't find anything wrong with it. Then I pump the front brake lever a few times. The brake light goes out. Ah, must just be a sticky lever. I check the actuation and the brake lights seem to be working again. We climb back on our bikes and proceed a bit further. Not 30 seconds later, Neda radios me again, "It's on again". I pump the front brakes and the light goes out. But it keeps coming back on again and again. This is not good. Even though I can't feel any drag in the front, I don't want to slowly burn up the pads or warp the rotor. I can't keep riding with the front brakes engaged. We pull over and I inspect the lever and pads. I sniff the air. Is that burnt brake pads I smell...? F*ăg**s*an*!!!! 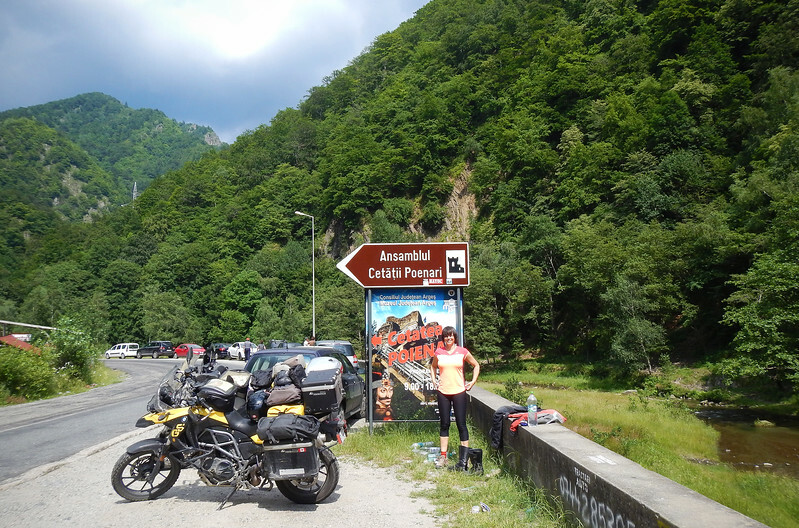 Stranded at the top of a mountain pass in Romania with a stuck front brake. We're hundreds of kms away from a city. What are we going to do now...?